Creavis, Evonik’s innovation unit, is turning 20. Its success depends on balancing its closeness to the company against its distance from it, explains Managing Director Stefan Buchholz. has headed the strategic innovation unit Evonik Creavis GmbH since October 2012. 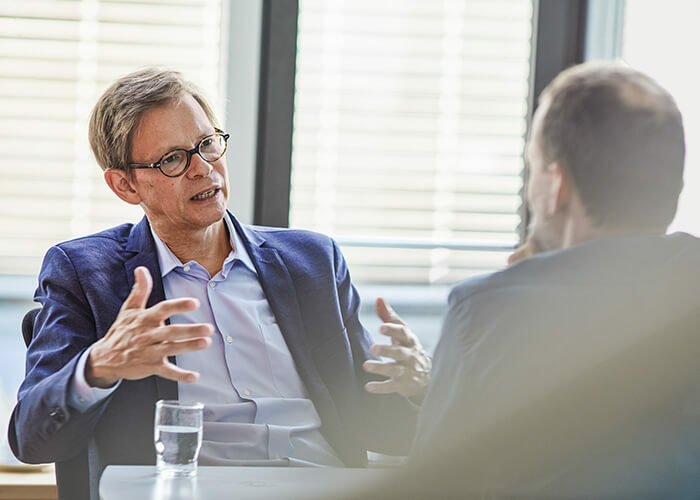 After studying chemistry in Marburg and earning a doctorate at the Max Planck Institute for Polymer Research in Mainz, he started his professional career in 1993 as a research associate at the former Degussa company in Frankfurt. From 2008 on, he was in charge of the Innovation Management unit of the Advanced Intermediates Business Unit at Evonik. He has been an honorary professor at the University of Stuttgart since 2011. Creavis has existed for 20 years as an independent strategic innovation unit. During this time, many other companies have followed Evonik’s example and created comparable structures. Why is it so difficult to forge ahead with innovations inside big industrial groups? Large companies’ responsibility to produce results in their business operations inevitably leads them to focus on shorter-term objectives. By creating a strategic innovation unit, Evonik’s Executive Board created a counterweight to this tendency. However, at Creavis we are not in a fundamentally different situation, because our resources are also limited. But we have a different perspective: We define “shortterm” as “over a period of five years,” whereas in the operational business it would mean “over a period of one to three years.” But in spite of our independence, we don’t do everything alone. Instead, we cooperate closely with the operating units—the business lines— especially the Project Houses. In which areas do you have to work closely with the company, and where do you need distance in order to create optimal conditions for innovation? That’s the central question! We need both. We need distance so that we’re not under daily pressure to generate profits. That’s why we compare Creavis with a greenhouse, where new ideas can sprout and where they have time to mature into new products or business models before being handed over to the operating units. But we also need a close connection with the company so that we can coordinate strategies for ultimately making the commercialization of these products and business models successful. Our job is to identify new themes and accumulate expertise so that we can develop products and open up new markets. When we get to the marketing stage, the responsible business unit at Evonik takes over. If the marketing stage is to succeed, it has to be clear in advance that there is interest in the new product. Is it possible for the strategic approach to be too narrow, so that it’s an obstacle to creative thinking and unpredictable innovations? We focus on seven innovation fields, six of which correspond to the innovation growth fields of the company. We have agreed with the company on very clear rules of procedure. And we cooperate closely with the heads of the operating units when we identify potential innovations in the individual growth fields. But not everything we work on has to fall within one of Evonik’s growth fields. In this regard, we take liberties—and after all, that’s exactly what we’re supposed to do. When you’re selecting projects, how closely do you cooperate with the company? Of course we don’t operate in a vacuum. But research requires freedom. The Steering Committee, which meets twice a year under the leadership of Harald Schwager, the Deputy Chairman of the Executive Board, provides the framework. This committee decides about matters such as the innovation fields that we recommend. However, when it’s a question of launching a new project within an innovation field, that’s an internal decision made by Creavis. What happens when ideas have a disruptive potential that could threaten the work that has been done so far by important business units at Evonik? In the area of product development, it often happens that a new product replaces an existing one. That can cause resistance. Especially in these cases, it’s an advantage to have a separate unit such as Creavis, where projects can be pursued until they reach a certain degree of maturity. And if these projects reveal the superiority of the new technology, it’s also easier to get the operating unit enthusiastic about it—for example, if we consider certain biotechnological processes that can replace conventional chemical processes. Creavis is founded as the innovation unit of Hüls AG. Merger of Degussa AG and Hüls AG to form Degussa-Hüls AG. First Project House for developing nanomaterials in Hanau. Entry into biotechnology through the launch of a Project House of the same name. The technological basis for the production of pharmaceutical amino acids via biotechnological processes is created at the Proferm Project House. How are new ideas generated at Creavis? It’s very hard to generate really good ideas. Of course I could assign my employees the task of inventing a beaming device like the one used in the Star Trek TV series. There would certainly be a need for it, and a market too. But we don’t have the technological know-how to make this idea a reality. In the past, researchers would often think up technological innovations without clearly knowing how they could be developed into salable products. Innovation takes place only at the point where two factors come together: an approach to a solution and a demand resulting in a market. That’s what we focus on here. Hierarchies don’t play a very big role at Creavis. We encourage all of our employees to develop their own ideas. But proposals can basically come from anywhere: from our employees, from the Executive Board or from our customers. Our Portfolio Development unit then has the task of assessing these proposals. That also enables us to react quickly to new ideas that are brought to us from outside the company. That’s a key factor for making sure that open innovation— that is, innovation in close cooperative networks with partners who contribute complementary expertise—works in practice. Keeping such networks operational is an important part of our strategic mission. In the Project Houses at Creavis, experts from various units at Evonik work on a topic for a period of three to four years. How did this model come about? This concept dates back to the Degussa company. Back then, the idea was to work cooperatively on topics that were relevant to several operating units and had a long-term outlook. However, in the beginning there were no direct connections with the operating units. That’s why it was decided to bring employees from these units together with Creavis for a period of three to four years in a Project House so that they could work together very closely for a limited period of time. This model brings together experience and know-how from various units within the Project Houses. Initially an important objective was to exploit the synergies between the various business units. Today the focus is more on developing expertise—for example, in the Medical Devices Project House. One of the projects we conducted there developed biodegradable materials for implants that are used to replace bones. There were already some points of contact with other parts of the company, but there weren’t any real activities. We built up a new research team and the entire infrastructure, invested several million euros in apparatus and lab equipment, and worked on concrete projects. In the end, we transferred the entire Project House to the Health Care business line as a competence center. What criteria do you use to decide which ideas you want to pursue? We have an “open innovation” approach, and within this framework we check with increasing detail whether the assumptions that underlie each project are actually correct. Does the technical approach to a solution fulfill the criteria that have been set for it? Is the solution really as sustainable as we presume it is? In the beginning, openness and flexibility are important. The further the project progresses, the more concrete are the questions we ask. All of the aspects that are relevant to a project’s success should already be thought of in the earliest phases possible. The managers at Creavis support the project managers by acting as consultants and helping them to realize their projects. But it can also happen that after a few months or even years the manager, together with the team, comes to the conclusion that the project should be discontinued because its further development would no longer be justified in economic terms. Development of the Science to Business Center in the Marl Chemical Park on the basis of open innovation together with cooperation partners from the science and business communities. 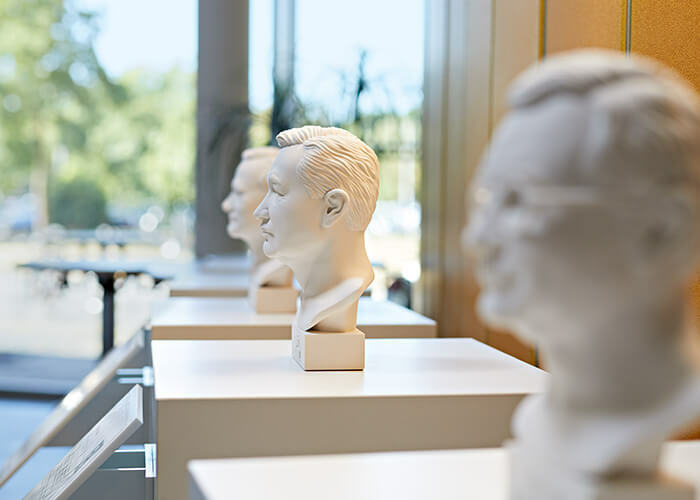 Clever heads: Outstanding researchers from the history of the Evonik companies greet visitors in the foyer at Creavis. What factors are needed in order to create and sustain an open innovation culture? I believe that the chemical industry as a whole is quite open. There has always been close communication between companies and universities. Basic research has generated lots of momentum for the industry. But there has been a fundamental transformation in the past two or three decades. Research is reaching its limits. In the past, pioneering discoveries such as polyethylene formed the basis for establishing entire industrial segments. Today innovation is much more strongly driven by the application. As a result, in the area of development we need a much better understanding of applications, and that means we have no other choice than using the open innovation approach. Let’s take 3D printing as an example. We want our materials to work for a variety of technologies, so we have to collaborate closely with the manufacturers of 3D printers. In addition to cooperation with our customers, interaction with startups is also gaining in importance. But we have to keep in mind that many innovations coming from universities are more likely to end up in startups than in major companies. That’s a good question, and there’s no simple answer for it. One important aspect is the fact that it has become harder to access the know-how of universities. That’s because the universities themselves are utilizing their patents. In many cases, they prefer to support a doctoral candidate who wants to open his or her own business through a spinoff, rather than backing a major industrial company. But we also have to be realistic and admit that there are lots of interesting ideas that might justify founding a new company but are not relevant for a major industrial group. When we enter new territory, we have to be on the lookout for bigger potential than most startups are interested in. In the innovation unit, which is headed by Stefan Buchholz, hierarchies don’t play a very big role. Every colleague is encouraged to contribute his or her own ideas. Integration of Degussa AG into Evonik Industries AG. The Light and Electronics Project House is launched in Taiwan. It’s the first Project House outside Germany. When is open innovation equally fruitful for the company and for its external partners? The biggest opportunities for us are in the areas where the knowledge is complementary. That’s why we’re interested not only in chemical startups but also, and perhaps even more, in young IT companies whose technologies can be combined with our products. This can generate benefits for both sides. Besides, we also work with other big companies, such as our major customers, with whom we jointly develop products. Many big companies are making an effort to establish an ecosystem of innovative startups. How are you proceeding in this area? We’re keeping a close eye on this development, and we’re involved in professional networks so that we can work together with partners in areas where it makes sense to do so. We closely coordinate these activities with Evonik’s corporate venture arm, which maintains connections in the venture capital scene and invests in startups. The launch of Creavis 3.0, which has three new units: Portfolio Development, Sustainable Businesses, and Science & Technology. The harmonized innovation process I2P3 takes into account the ecological and social consequences of potential projects at an early stage. Entry into 3D printing through the establishment of the Direct Manufacturing innovation field. Independent development units have been created within many companies in recent years. What experiences have you gathered as a pioneer that the newcomers still have ahead of them? We’ve learned that it’s important to maintain the right balance between closeness to, and distance from, the company —and to have great operational freedom as well as a high level of strategic coordination. We’re doing that much better now than we did in the beginning. Many companies from other sectors have come to us in order to learn from our experiences, because digitalization is forcing them to reorient themselves to an unprecedented extent, and because they don’t possess the innovation culture that we’ve always had in the chemical industry. Is the success of Creavis measurable? Through Creavis, the company is investing in long-term innovation. And it wants to receive something in exchange for its investment. That’s why for the past five years we have sat down together with the business line that is profiting from one of our innovations and used the discounted cash flow method to determine the value of each newly developed product. The business lines are very critical in this regard. At the end of the year, the value of all the transferred projects has to be commensurate with Creavis’ expenditures. That’s the benchmark for our success. The temporary Medical Devices Project House is transformed into a permanent competence center. The recently launched Tissue Engineering Project House is intensifying Evonik’s research in the area of regenerative medicine. If you’re trying to forge ahead with innovations and take bold new steps, do you experience failures as well as successes? For a researcher, it’s normal to have some things that don’t work out as expected. I’ve spent years working in laboratories myself. About 99 percent of the trials don’t deliver the result that was hoped for. That’s normal. Researchers traditionally don’t talk about a failure—instead, they think about the next trial. The wonderful thing about this approach is that in the end you’ve got a lasting success—and the many bitter setbacks you had on the way there are quickly forgotten. If you look back at Creavis’ first 20 years, what were your biggest successes? Creavis’ biggest success might be the fact that today we have a corporate growth field called Membranes. The second big success story is the area of biotechnology, which we have expanded through our development work. And the most recent example of a successful product launch is REHANCE ONE, a natural ingredient for cosmetics that recently received an award at a major professional trade fair. The foundation stone for this development was laid at Creavis. The crucial ingredients of successes like these are the combination of various kinds of expertise at Creavis, our willingness to take risks, and our long-term orientation.